Posted on Sep 12, 12:31 AM in Breakfast and Well Being. No comments. Bircher muesli seems to be all the rage at the moment. 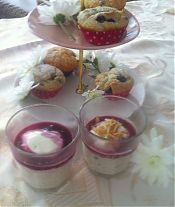 Called by a variety of names including “overnight oats”, bircher muesli is the original muesli invented in around 1990. I love it when historical recipes come back in fashion. In the good old “hospital dietary therapy” tradition, Swiss Doctor Maximilian Bircher-Benner, a pioneer of whole foods therapy, invented muesli for patients in hospital. The original recipe consisted of rolled oats, (soaked in water overnight), lemon juice, sweetened condensed milk, grated apple and grounds nuts. Posted on Jul 3, 09:18 AM in Breakfast and Main Course. Comments . I’m working on putting some vegetarian meals into my family’s diet and like this one particularly as it can be eaten at breakfast, lunch or dinner. How versatile! 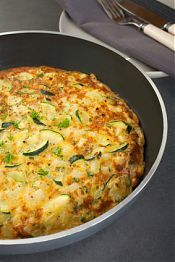 This recipe is a bit of a frittata really and includes the goodness of peppers/capsicum, mushrooms and courgettes/zucchini with good old eggs. And, no, you dont have to be afraid of eggs. The old “3 eggs a week” message I used to trot out when working for the heart foundation many years ago has well and truly been replaced with “eggs are fine” after all the evidence we have gathered on eggs over the years. Eggs are a great source of protein and there is evidence that they help make us feel fuller for the morning when eaten at breakfast. So give this a try, makes a change from the usual..
Do you have any nutrition questions? I'm always interested in hearing them, and I'll do my best to answer.